AY2015 International Conference "Catastrophe and Justice: Migration"
*There is no parking available at the venue, so please use public transportation. 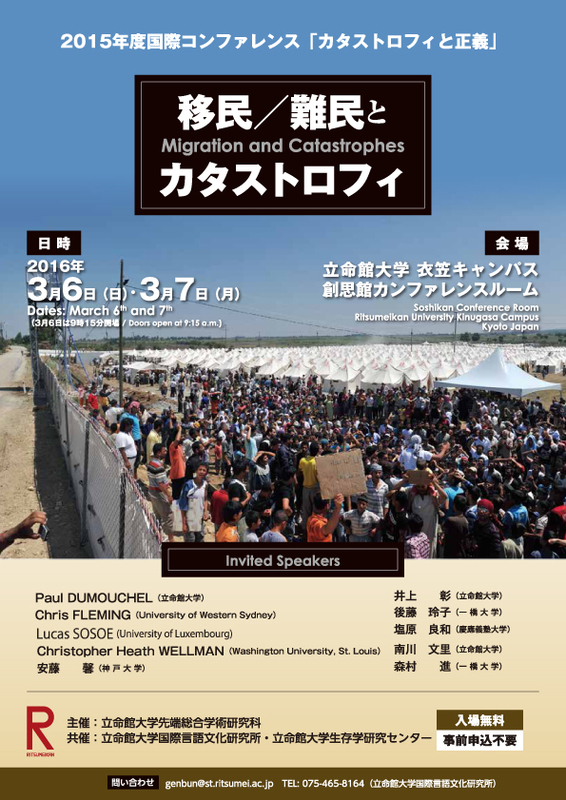 In this event, we focus on “catastrophic situation of migration” as a part of the research program entitled “catastrophe and justice” at the International Institute of Language and Culture Studies, Ritsumeikan University. Catastrophic situation of migration has been regarded as a problem for a long time and nowadays it is discussed radically over the acceptance of Syrian refugees. In this event we will examine catastrophic situation of migration from various viewpoints including normative theories (especially theory of justice), sociology and anthropology. *For details please refer to the poster program (PDF file).